Recently, Doodle Jump celebrated its 4th birthday. That’s a long time for an app to be around, and especially to remain as popular as Doodle Jump is! Assuming you’ve never heard of Doodle Jump (or seen that ridiculous Kevin Durant commercial), allow me to explain the app. 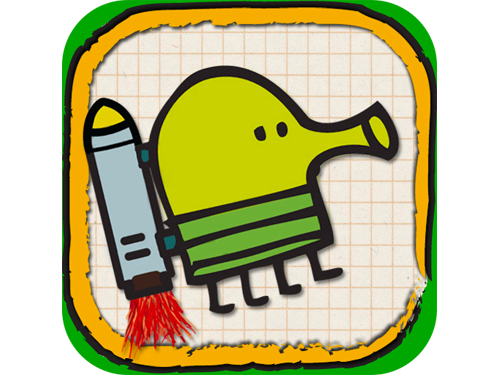 Doodle Jump is a $0.99 game that is so simple that it’s great for all ages. There is also a special iPad version called Doodle Jump HD for $2.99. It’s just a platform jumping game, in which you tilt your device left and right to move the character so that he lands on all the platforms. Each platform will bounce you up higher and higher until you either miss, get hit by a monster (which you can shoot at by tapping), or fall into a hole in the background. Obviously, the higher you get, the more scarce the platforms are, thus the harder it is to land on them and keep going. Also, you may get lucky and land on platforms that contain springs to boost your jump, propeller hats to fly you up a bit, or jetpacks to really throw you up high. That’s pretty much all there is to the gameplay. The graphics are not 3D or anything special, but to be honest, right now is the only time I’ve ever thought about the graphics. The game is just so simple that it doesn’t need any fancy graphics. So, you may ask, what is with all the hype around Doodle Jump? I can’t say that I’m really sure. I don’t love the game, but as I understand, some people just cannot put it down. I don’t like how it costs a dollar, when there are similar games for free, but maybe the reason for all the great reactions is the theme selection. Doodle Jump has a bunch of themes to play, and they steadily add more and more with updates. Some themes include: Christmas, halloween, rainforest, space, soccer, ocean, Easter, nighttime, and so on and so forth. I’ll admit, they are pretty unique and interesting, but the bottom line is that they don’t really make the gameplay any different or more fun. I don’t know what it is about this game, but all I’m doing is giving an honest review of my opinion. You may not agree with me on this one (many people love this game), so I challenge you to try out Doodle Jump and answer the survey at the bottom of this review. But in my opinion, Doodle Jump is no greater than the semi-respectable 5/10.